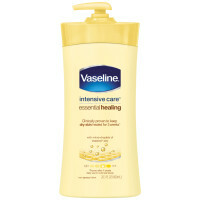 Apply Vaseline® Intensive Care™ Essential Healing Lotion to your skin daily to heal dry skin. Vaseline® Intensive Care™ Essential Healing Lotion provides fast absorbing moisture to give you deeply moisturized, healthy skin. 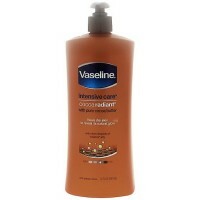 Clinically proven to keep dry skin healed for 3 weeks*, it’s a body lotion you can count on. *Proven after 4 weeks daily use in a clinical study Moisturizes Deep Down to heal dry skin Every day, your skin is exposed to damaging environmental factors like extreme temperatures, low humidity, harsh cleansers and hot water. 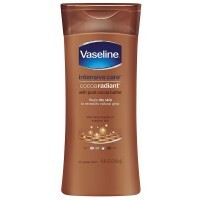 This is why Vaseline® body lotions are designed to penetrate the stratum corneum (outermost layer of the skin) to heal dry skin, not just provide temporary, superficial relief. Vaseline® Intensive Care™ Essential Healing Lotion is formulated with a special blend of glycerin, a humectant that draws moisture to the skin, and Vaseline® Jelly, which locks in moisture. 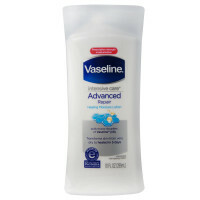 Its deeply moisturizing formula provides effective, long-lasting skin hydration. With such nourishing ingredients, Vaseline® Intensive Care™ Essential Healing Lotion is the perfect daily body lotion for maintaining smooth, soft skin. 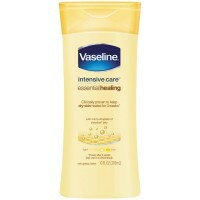 Non-Greasy Body Lotion Vaseline® Intensive Care™ Essential Healing Lotion relieves dry skin quickly by penetrating skin layers with its fast absorbing formula. Its light and non-greasy formula glides onto your skin effortlessly to provide a clean, deeply moisturized feeling without the greasy feel. Ideal for when you want to get on with your day, this body moisturizer absorbs quickly, so you can get dressed within minutes of application.